I can't believe I'm writing this post because it honestly felt like the day we would sell the house I grew up in and inherited when my mom passed away would never really come. It was a lot of work and required help from family, hours spent out in the hot Texas sun, and a couple of tears shed by me. Hurricane Harvey also hit the weekend before we were supposed to close, so that caused some additional stresses and delays. 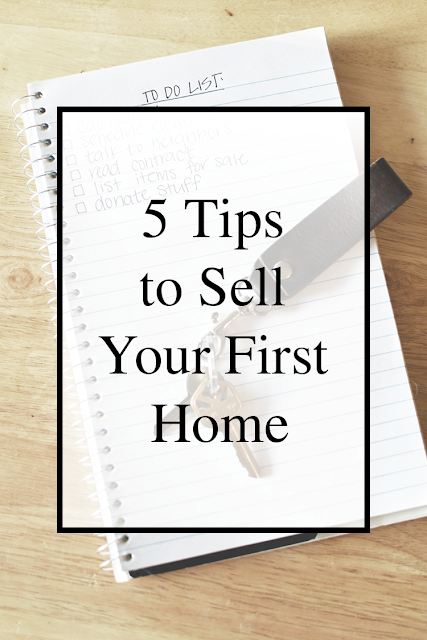 Whether you're selling a house you inherited, your first home, or an older home that could use some TLC I thought I would share some tips and things I learned along the way. The selling process can be really scary for first time sellers (at least it was for Kyle and I) and I had no idea how much I would learn in the process. As a disclaimer I am definitely not a real estate expert, home repairs expert or any combination of the two. I am simply sharing with you my experience in selling a home that needed a little love! For some of you this will be easier than it was for me. Selling our home was nearly six years in the making for a few different reasons. I was emotionally attached yet distant all at the same time. There was obviously a lot of love and memories in the house as it is where I grew up, but at the same time it held a lot of pain for me as those memories were ones spent with my mom. On top of 20 some odd years of memories, there was also that many years worth of stuff. Now, I'm not saying we were hoarders by any means, but it is shocking how much stuff we as humans accumulate over a period of time. So, my first tip is to be realistic with the time you will need to clear things out, both physical and emotional! No, I'm not kidding. Remember when I just mentioned that we had 20 years worth of stuff in a house? In case you're wondering what that amount of stuff looks like, its about a 30 yard dumpster filled to the brim and an entire front yard worth of stuff given away for free. No matter how big or small your house is, I cannot recommend renting a dumpster enough. I can't even start to think how many hours of labor, gas money and energy it saved us. The process is renting one is relatively simple. All you have to do is call a company (here is the company we used), they advise you on how large of one you will need based on the task at hand and they schedule your delivery and pickup! Otherwise you will be making endless trips to the dump or making the people who pick up your trash seriously hate you. So this tip has two parts. If you're clearing out a house and have stuff that is too good to throw away and you don't want to haul it off to a donation place, ask your neighbors if they need anything! I did this and they seriously took a lot of stuff off my hands that would have otherwise taken time to donate or space in my dumpster. The next part of this tip is to ask your neighbors for recommendations on realtors, handymen and/or contractors. All of the professionals that helped us with our house came through recommendations from other people and they could not have been more pleasant to deal with. You can always research people online these days, but it's nice to have a personal recommendation from someone you know! Maybe the choice you make when it comes to repairs is based off your timeline, maybe it's based off your budget or maybe it's based off what the condition of other homes in your area are like, but I guarantee you something will need to be done. You may make the choice to sell the home as is and that's perfectly fine - Kyle and I considered that - but I urge you to talk to realtors prior to making the decision and see if you can get a return on the investment. We really didn't think we would be able to, but after seeking advice we found out it would be in our best interest to put a little in to be able to ask a little more for our property. I feel like this really could go without saying, but sometimes you need a little reminder that it is more than okay to ask questions and take your time when reading through all of the paperwork. Kyle and I are opposites in that I am a big picture, get stuff done kind of person and he is a detail oriented, question connoisseur. This really helped keep both of us in check when it came to making decisions and that we were on track with timelines. You should consider your realtor a resource and remember that they are they to help you. I also suggest asking friends and family who have been through the process before to help advise you in certain situations. I hope this post helps you a little if you are planning on selling a home any time soon! If you have any specific questions, don't hesitate to reach out and I will do my best to answer. Also, if you are in the Houston area and looking for a good realtor, handyman, or companies we used, let me know and I can pass along the information!